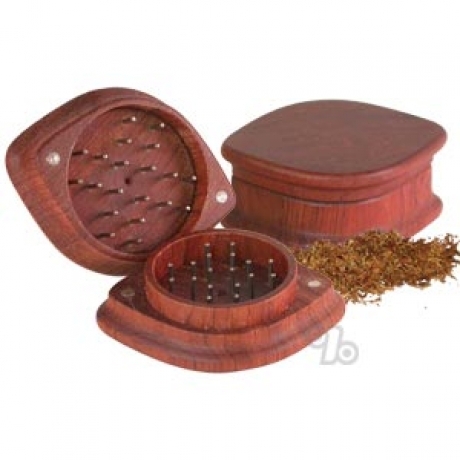 This fine Rosewood Herb Grinder with a unique Eye shape is made from aged & cured plantation-grown rosewood, stainless steel pins, and magnets to hold it together. Offers an excellent ergonomic grip and is designed for the long haul. Guaranteed not to warp with regular use. All 1905 grinders are precision made by high tech machines instead of underpaid workers in developing countries. You can easily see the difference in quality. In South America, some places all you can get is bricks. That stuff just bends the pins of this grinder. But it grinds up dry flower really nicely. I straightened the pins with a pair of pliers and now I'm careful with it. Sometimes a thick stem bends a pin slightly, but if you have a pair of pliers, you're golden. Bought this as a Christmas present and got a chance to try it out...it's on the smaller side but it works great nonetheless. The magnetic dots on the ends make for a cool feature as well. This grinder makes rolling much easier, it is compact and works very well.